In nautical terms, a brig is a vessel with two square-rigged masts. During the Age of Sail, brigs were seen as fast and maneuverable and were used as both naval war ships and merchant ships. They were especially popular in the 18th and early 19th centuries. Brigs fell out of use with the arrival of the steam ship because they required a relatively large crew for their small size and were difficult to sail into the wind. They are not to be confused with a brigantine which has different rigging. In sailing, a full-rigged brig is a vessel with two square rigged masts (fore and main). The main mast of a brig is the aft one. To improve maneuverability, the mainmast carries a small fore-and-aft sail (also called a gaff sail). Brig sails are named after the masts to which they are attached: the mainsail; above that the main topsail; above that the main topgallant sail; and occasionally a very small sail, called the royal, is above that. Behind the main sail there is a small fore-and-aft sail called the spanker or boom mainsail (it is similar to the main sail of a schooner). On the foremast is a similar sail, called the trysail. Attached to the respective yards of square-rigged ships are smaller spars, which can be extended, thus lengthening the yard, thus receiving an additional sailing wing on each side. These are called studding sails, and are used with fair and light wind only. The wings are named after the sails to which they are fastened, i.e. the main studding sails, main top studding sails, and the main top gallant studding sails, etc. The brig’s foremast is smaller than the main mast. The fore mast holds a fore sail, fore top sail, fore top gallant sail, and fore royal. Between the fore mast and the bowsprit are the fore staysail, jib, and flying jib. All the yards are manipulated by a complicated arrangement of cordage named the running rigging. This is opposed to the standing rigging which is fixed, and keeps mast and other things rigid. A brig is “generally built on a larger scale than the schooner, and often approaches in magnitude to the full-sized, three-masted ship.” Brigs vary in length between 75 and 165 ft (23–50 m) with tonnages up to 480. Historically most brigs were made of wood, although some latter brigs were built with hulls and masts of steel or iron (such as the brig Bob Allen). A brig made of pine in the nineteenth century was designed to last for about twenty years (many lasted longer). The word "brig" has been used in the past as an abbreviation of brigantine (which is the name for a principally fore-and-aft two-masted rig with a square rigged foremast). The brig actually developed as a variant of the brigantine. By re-rigging a brigantine with two square sails instead of one it gained greater sailing power. The square-rigged brig's advantage over the fore-and-aft rigged brigantine was "that the sails, being smaller and more numerous, are more easily managed, and require fewer men or 'hands' to work them." The variant was so popular that the term "brig" came to exclusively signify a ship with this type of rigging. By the 1600s the British royal navy defined "brig" as having two square rigged masts. Brigs were used as small warships carrying about 10 to 18 guns. Due to their speed and maneuverability they were popular among pirates (though they were rare among American and Caribbean pirates). While their use stretches back before the 1600s, one of the most famous periods for the brig was during the 1800s when they were involved in famous naval battles such as the Battle of Lake Erie. In the early 1800s the brig was a standard cargo ship. It was seen as "fast and well sailing", but required a large crew to handle its rigging. While brigs could not sail into the wind as easily as fore and aft rigged vessels such as schooners, a trait that is common to all square-rigged ships, a skilled brig captain could "maneuver it with ease and elegance; a brig could for instance turn around almost on the spot". The need for large crews in relation to their relatively small size led to the decline of the production of brigs. They were replaced in commercial traffic by gaffsail schooners (which needed fewer personnel) and steam boats (which did not have the windward performance problems of square rigged ships). The Telos, built in Bangor, Maine in 1883, was reportedly the last brig to join the American merchant marine, and was "considered to be the finest vessel of her class ever constructed in Maine". She was wrecked on Aves Island, off Bonaire in the Caribbean, in 1900. Painting of the brig USS Niagara in the Battle of Lake Erie. The brig USS Argus used during the First Barbary War and the War of 1812. The brig USS Oneida used during the War of 1812. James Fenimore Cooper was a midshipman aboard the Oneida while under construction. The cargo hauling brig Farmer owned by George Washington. The cargo hauling brig Fleetwing. The brig Leonora of Captain Bully Hayes. The brig USS Niagara captained by commander Oliver Hazard Perry in the Battle of Lake Erie, a pivotal victory for the United States in the War of 1812. The brig USS Oregon used in the U.S. Exploring Expedition. The cargo brig Pilgrim, whose 1834 trading voyage from Boston, Massachusetts to California is described in the book Two Years Before the Mast. The brig Rebecca captained by Robert Jenkins whose boarding triggered the War of Jenkins' Ear. The brig USS Reprisal that fought in the American Revolution. The brig USS Somers, sunk in the Mexican-American War. HMS Beagle was built as a brig (1820) for the Royal Navy. She was deployed as a survey vessel to survey the coasts of South America, Australia, and Africa. A mizzen mast was added prior to the 5 year voyage with Charles Darwin to increase the maneuverability in the shallow coastal waters that she would explore. Jean Lafitte's pirate brig, the Pride from 1815 to 1816. Note that while the famous mystery ship Mary Celeste is sometimes called a brig, she was clearly a brigantine. The brig Sea Hawk in "The Pirate of the Mediterranean" by William Henry Giles Kingston. The brig Interceptor in the film Pirates of the Caribbean: Curse of the Black Pearl (portrayed by the brig Lady Washington). The brig Enterprise in the film Star Trek Generations (also portrayed by the brig Lady Washington). The brigs Porta Coeli and Amélie appear in the Horatio Hornblower series by C. S. Forester (which was later adapted to films and television). The brig HMS Sophie in Master and Commander by Patrick O'Brian. The brig Molly Swash, in James Fenimore Cooper’s book “Jack Tier”. The brig Hellebore in the Nathaniel Drinkwater series by Richard Woodman. The brig Isle of Skye in Iain Lawrence's “The Wreckers (High Seas Trilogy)”. The brig Seahawk in Avi's novel The True Confessions of Charlotte Doyle. The brig Blue Bird in Evert Taube's song "Balladen om briggen Blue Bird av Hull". The brig Grampus in Edgar Allan Poe's novel The Narrative of Arthur Gordon Pym of Nantucket. The pirate ship of Captain Hook, the brig Jolly Roger from James M. Barrie's Peter Pan. The pirate ship, the brig Speedy from Jules Verne's The Mysterious Island. The ship Constanzia from Jules Verne's A Drama in Mexico. The brig Arkham in H. P. Lovecraft's At the Mountains of Madness. The brig Poison Orchid in Scott Lynch's Red Seas Under Red Skies. ↑ "Schooner In The Sand". JANUARY 2002. http://www.michigan.gov/documents/hal_mhc_mhm_schooner_tg_07-09-2002_92621_7.pdf. Retrieved 2007-01-12. ↑ 2.0 2.1 2.2 "Sailing ships". http://www.njscuba.net/artifacts/ship_sailing_ship.html. Retrieved 2007-01-12. ↑ 3.0 3.1 3.2 3.3 3.4 R.M. Ballantyne. "Man on the Ocean". http://www.athelstane.co.uk/ballanty/manocean/ocean10.htm. Retrieved 2007-01-12. ↑ 4.0 4.1 "The Texas Navies". http://www.texasnavy.com/glossary2.htm. Retrieved 2007-01-12. ↑ 5.0 5.1 "Bob Allen". http://www.tallshipstock.com/BOB%20ALLEN%201.txt. Retrieved 2007-01-12. ↑ 6.0 6.1 "Pirate Ships". http://groups.msn.com/6nb38spqtrspsianegph7fjk07/ships.msnw. Retrieved 2007-01-12. 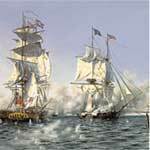 ↑ "Brig or Brigantine". http://www.mariner.org/exploration/index.php?type=shiptype&id=3. Retrieved 2007-01-13. ↑ 8.0 8.1 8.2 "The "Stockholm Brig" Tre Kronor". http://www.abc.se/~pa/bld/sth-brig.htm. Retrieved 2007-01-12. ↑ "Brig". http://sailing-ships.oktett.net/brig.html. Retrieved 2007-01-12. ↑ "The "Stockholm Brig" Tre Kronor Homepage". http://www.briggentrekronor.se. Retrieved 2008-06-17. Maritime Heritage Network, an online directory of maritime history resources in the Pacific Northwest. Search Wiktionary Look up brig in Wiktionary, the free dictionary. This page was last edited on 12 July 2010, at 14:42.